Why do cucumbers curl into a C-shape? Most cucumbers grow in a straight cylindrical shape. Except when they don’t. Sometimes, a cucumber will curve into a C-shape. This is called cucumber fruit curl. It is also called crooking. There are many causes for crooking. Which one is affecting your fruit? Some sap-sucking cucumber pests can cause crooking. This form of crooking is usually irregular, having been caused by thrip, mite, and whitefly feeding. Aphids, scale, and mealybugs can also cause this type of deformity. Cucumbers are heavy feeders. They need nutrient rich soil and regular feeding to produce a healthy crop of uncurled cukes. You can side dress the vines with aged compost. This also acts as a mulch, which helps stabilize soil temperatures and reduces the need for added water. Think about how much of a cucumber is water. Add the water needs necessary to grow the vines and you will see that cucumbers need a steady supply of water. This means watering regularly and consistently. If you have placed mulch around the vines, add water whenever the top inch of soil feels dry. Hot weather kills pollen. This can mean the female flower did not get enough pollen to produce a properly shaped cucumber. This normally causes stunting or lopsided development, but it can also cause curling. Newly forming cucumbers are easily pushed around by stems, leaves, and flowers, as well as the ground itself. Also, if the flesh is damaged early on in development, the damaged side may grow more slowly, causing a curled shape. Prepare the beds with aged compost. Train cucumbers up a trellis, with plenty of space between each plant. Keep the soil evenly moist. Monitor for pests and treat with insecticidal soap or neem oil. A curled cucumber is fine to eat. We’ve all played with sand at some point. There were probably waves crashing in the distance, the smell of tanning lotion and sunscreen mixing with salty air. Sand gets everywhere and it can be used to make some amazing temporary castles and other works of art. It is also a component of soil. If you live in Florida, you know all too well how difficult it is to keep nutrients and water in your sandy soil. This is because the spaces between the grains of sand are so big. At the other end of the spectrum, clay is made up of flat plates that tend to stick together, holding tightly to water and nutrients and making it difficult for plant roots to move through it. It very few macropores and micropores, which means drainage and aeration are common problems. This is also why it makes such nice pottery. What is a gardener to do? Our intuition tells us that we can lighten heavy clay soil by adding sand. It sounds right. Sand has plenty of spaces! Putting the two together should give us a nice, happy medium, right? Wrong. Instead, the tiny clay particles fill in all the spaces around the sand grains, creating a soil that is even heavier than before! Organic mulch to the rescue! When I say ‘organic mulch’, I am not necessarily saying organic in the OMRI sense, although that is what I use. Organic mulch refers to mulch composed of materials that were or are alive: plants, animals, bugs, manures, that sort of thing. It does not include ground up plastics or other manufactured materials. When you incorporate organic mulch into sandy soil, you provide materials that can bind nutrients and water to the planting bed. The macropores become partially filled with water- and nutrient-retaining compost. When you top dress heavy clay soil with an organic mulch, earthworms, microorganisms, irrigation, and other actions will slowly incorporate chunks of non-clay material below the soil line, creating macropores and micropores for air, water, and plant roots to move through. Top dressing means you just leave the material on top of the soil, rather than digging it in. Digging clay soil is generally not helpful because of the smooth surface left behind by the shovel. When that surface dries, it can be impenetrable. So, leave the sand at the beach or in your egg timer. If you have clay soil, organic mulch is what you want to use. You may be surprised to learn that sand is a non-renewable resource in high demand, due to our penchant for concrete. Apparently, creating sand take eons and we use a lot of it. The summer song of crickets and grasshoppers provide many of us with a comforting reminder of childhood. If you are a gardener, your might hear those sounds with different ears. Cousins to katydids and locusts, crickets (Gryllidae) and grasshoppers (Acrididae) are members of Orthoptera. Crickets have long antenna, while grasshopper antenna are short. Grasshoppers chirp by rubbing their wings against their legs, while crickets only rub their wings together. Crickets’ ears are at the bottom of the abdomen, while grasshoppers’ ears are in their tibia (front legs). Grasshoppers prefer coming out in the daytime, while crickets are ‘crepuscular’, which means they prefer evening, and nocturnal. Crickets are omnivores, while grasshoppers are herbivores. Both species start out as eggs that were laid, in late summer and early fall, in the top 2 inches of soil, in clusters of 20 to over 100 eggs. In spring, these eggs hatch as nymphs, which begin feeding on nearby plants. When those food supplies are exhausted, they look for new places to feed, generally downhill from where they started. Grasshoppers will molt 5 or 6 times as they outgrow their exoskeletons, and crickets molt 8 or more times. There is no pupal stage, so these insects are said to go through incomplete metamorphosis. There are house crickets and field crickets. Both are collective terms for several different cricket species. All of them feed on seeds and plants, along with grasshopper eggs, moth and butterfly pupae, flies, and spider sack lunches. House crickets (Acheta domesticus), sold as lizard food, are usually brown or tan, and one inch long or less. Field crickets are slightly larger than house crickets and they are usually black. While there are over 200 different types of grasshoppers in California, only two cause significant damage: the valley grasshopper (Oedaleonotus enigma) and the devastating grasshopper (Melanoplus devastator). Most grasshoppers can fly. The chirp made by crickets and grasshoppers is called a ‘stridulation’ and it is made when they rub their wings together or against their legs. These insects have corrugated bumps on their wings and legs, similar to a percussion instrument called a güiro [gweer-o]. These parts are called the scraper and the file. Each species has a distinct stridulation and it is normally the males who do the singing. When males are courting, they have a song that is different from their normal hey-I’m-over-here song. When females sing, they do it very quietly. The vibrations caused by this action reminds us that it is summer, and announces to other crickets and grasshoppers an individual’s presence. If their song didn’t tell you these pests had arrived, chewed holes in leaves certainly will. Grasshoppers and crickets will often hide out in nearby weeds and brush, so keeping those areas mowed can reduce the likelihood of a visit. On the flip side, maintaining a lush, green border may provide all the feeding that is needed by a few individuals. In any case, a single cricket will not do significant damage, but a large number of them can decimate a row of seedlings in just one night. Grasshoppers prefer green plants, so your lettuce, onions, carrots, corn, beans. melons, squash, and some annual flowers are vulnerable. Grasshoppers may also feed on citrus, avocado, and beets. In years with especially wet springs, cricket and grasshopper populations can explode. In these years, food scarcity makes all plants vulnerable. If these insects are causing damage in your garden or landscape, floating row covers, screened boxes, and cones are your best bet. Just be sure there are not any individuals hiding out in the mulch around your plants, or you may create a virtual Club Med for the pest! Birds, robber flies, and blister beetles feed on crickets and grasshoppers, or their eggs, and many parasites, bacteria, and fungi attack these garden pests. You can hand pick them if you are quick enough. Chickens are excellent at catching them, and it’s a riot to watch. * For you word game and vocabulary nerds, saltatorial is an adjective that describes the legs of jumping insects. Callus is what plants use instead of bandaids. Tree wounds can occur on purpose, by pruning, or by accident, from heavy winds or by being overladen with fruit. Most pruning cuts are relatively smooth. Accidental wounds tend to be jagged and the bark may be torn down the trunk. In these cases, the tree will benefit from the branch being cut back to a place where a flat wound is possible. This gets rid of insect hiding places and speeds the healing process for the tree. In both cases, interior tissue is exposed to the elements. For decades, people have said that we should protect tree wounds with paint, pastes, and salves, which are generally petroleum based. The idea behind these treatments was that an open wound was vulnerable and that we could ‘help’ our trees by painting the cut surface with tar, asphalt, wound paint, or some other sealant. Instead of providing protection, these treatments actually seal in harmful bacteria and fungi, increasing the chance of disease or decay. Also, there are certain disease-carrying organisms that love to feed on or are otherwise attracted to the sealant! It ends up, trees already know how to protect themselves. Just as our skin forms a callus in response to hard work and friction, trees create tissue over wounds to protect themselves from pests and diseases. The word ‘callus’ is from the late Middle English Latin word ‘callosus’ which means ‘hard-skinned’. Trees are able to generate their own ‘hard skin’ to cover a wound. If that process is interrupted with oil-based sealants, the internal processes of decay prevention may also be interrupted. One case where wound dressing is a good idea is in regions (like ours) where oak wilt is a problem. If an oak in these areas is damaged or requires pruning, a sealant that contains insecticide and fungicide can prevent loss of the tree. Why do the flowers keep falling off your tomato, squash, melon, and bean plants, and citrus trees? This condition is called blossom drop. Blossom drop can be caused by several factors, most of which are perfectly normal. Others, not so much. Generally speaking, unfertilized flowers are kicked to the curb. Here are some species-specific causes of blossom drop. Most citrus trees will produce far more flowers than they could possibly bring to maturity. When the tree decides it has enough fertilized flowers, usually around June, the rest are discarded. It’s nothing to worry about. The first flowers on your melons, winter or summer squash, and cucumber are generally male. These drop naturally after a brief appearance. If female blossoms start falling off, it is usually because of thrip damage, poor soil fertility, environmental factors, or inadequate pollination. You can attract more bees and other pollinators to your garden by adding yarrow and bee balm. You can also allow onions, carrots, and fennel to go to seed. These plants will all provide pollen and nectar to beneficial insects that should increase pollination rates. If that doesn’t work, you can always try hand-pollinating. Temperatures over 90°F will cause bean flowers to abort. This can also occur with insufficient irrigation and poor air quality due to smog or fires. If you know your summer temperatures are likely to go over that threshold, try planting beans earlier or later in the season. Luckily, when environmental conditions cause blossom drop, most plants will simply try again, producing a second crop of blossoms. Pergolas are more than shade structures. Shade structures protect us from the sun’s summer glare, but they are often poorly made and generally don’t last more than a season or two. Pergolas, on the other hand, are sturdy structures that can provide shade for decades. Let’s find out why pergolas are such a good idea. Shade can reduce the ambient temperature by as much as 15°. If it’s 100°F outside, that can make a huge difference in your comfort, your plants’ health, and your cooling bill. The word ‘pergola’ comes from the Latin word ‘projecting eave’. People have been creating shade for themselves since, well, since there have been people! At first, pergolas provide only marginal protection from the elements. Over time, as climbing plants make their way up and across the top of your pergola, the shade protection can become significant. After many years of growth, your pergola may even offer something of a rain barrier! This decision is one of those time-or-money questions. Most of us have one or the other, but rarely both. If you have time and tools, you can find designs online and at your local library for a wide variety of pergola styles. The building process is relatively straightforward. If you prefer more convenience, there are ready-made pergolas with the lumber already cut and drilled and all you do is assemble the pieces. If you have money to spare, the sky is the limit. You can custom design a pergola to fit your space and style, creating a unique, artistic sanctuary in your garden or landscape. Most climbing plants, even self-clinging varieties, will benefit from a little help, at first. You can gently tie new stems to the nearest pergola post, leaving the ties in place until the tendrils have taken a firm hold on their own. Once plants have reached the top of the pergola, these ties can be removed. So, more than just shade, a pergola can provide support structure for climbing plants, reduced water and electric bills, increased home value, and even art! Bacterial speck may sound redundant - we all know bacteria are tiny - but bacterial speck is a bacterial disease of tomatoes that can be controlled with a speck of good cultural practices. Bacterial speck looks a lot like bacterial spot and bacterial canker, but it is less likely to be fatal. All three diseases appear as small brown or black lesions on leaves, stems, and fruit. These lesions may merge into larger, irregularly-shaped areas. There is normally a yellow halo around these lesions and the interior tissue dies rather quickly. Most of these lesions are found near leaf edges (margins). On fruit, the lesions look like tiny black bumps. Bacterial speck is caused by Pseudomonas syringae pv. 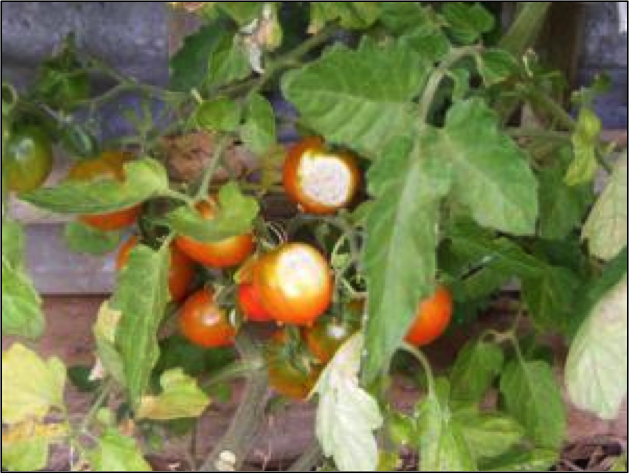 tomato, a cousin of the bacteria that cause angular leafspot, citrus blast, and leaf spot. This bacteria is found in soil and on seeds. Seeds from diseased fruits should not be planted the following season, or you will simply continue the process in your garden. These bacterium can remain dormant for a very long time, until the weather turns cool and damp. Then they start growing like crazy. The bacteria are frequently splashed onto leaf surfaces by rain and overhead watering. Fixed copper sprays and good air circulation are your best preventative measures. You can also delay spring planting until after temperatures warm up, and avoid overhead watering. Properly spacing plants can reduce the spread of infection. Diseased fruits are safe to eat, simply cut out the infected areas and toss them in the trash (or feed them to your chickens). Diseased plants should not be composted. Instead, toss them in the garbage to reduce the likelihood of reinfection. 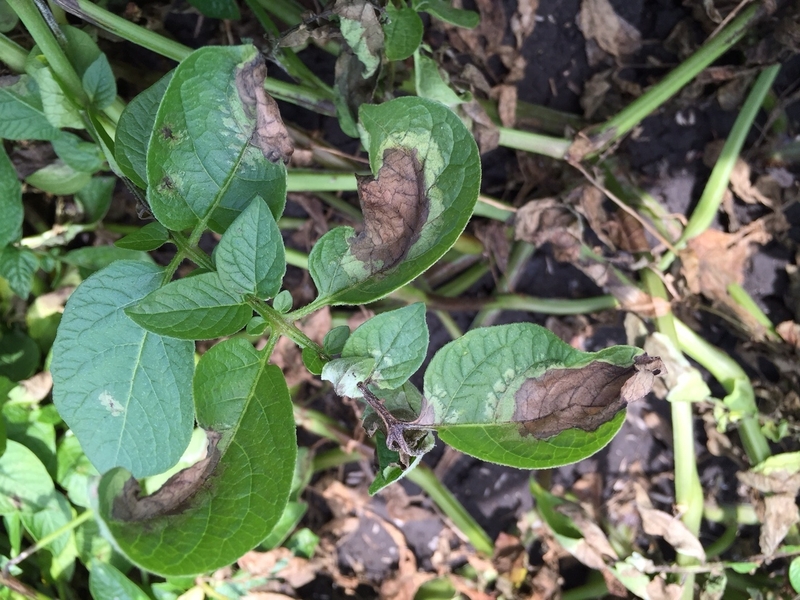 Blight is a symptom of plant disease. One day, your plant looks lush and healthy. The next day, several leaves are yellow and then turn brown. Stems, flowers, and branches also turn brown and then die. What can cause this sudden, severe damage? It might be blight. Blight is not a disease. It is what several different plant diseases look like. The initial symptoms appear suddenly and spread very quickly. Leaves, fruit, stems, and flowers can all be affected. The first symptom is tiny lesions on leaf tissue. This is where the bacteria or fungi first enter the plant, usually through small tears. The pathogens may also enter through vulnerable new growth. What starts out looking like leaf spot soon covers entire areas of a plant. Leaves and flowers suddenly lose all their green and turn pale yellow (chlorosis), followed by spotting, browning, withering, and dying. What summer picnic would be complete without watermelon? Sweet, refreshing, and adaptable, watermelon is another easy-to-grow addition to your foodscape. Botanically, watermelon is a type of berry called a pepo. It is also a gourd. As a member of the cucurbit family, watermelons are cousin to cucumbers, squash, pumpkins, and other melons. Watermelons were cultivated 5,000 years ago, in Ancient Egypt. Watermelon seeds were even found in King Tut’s tomb! Watermelon ancestors were not the bright red, sweet fruits we know. In fact, the original watermelons tasted pretty awful. They were bitter and hard. People grew them anyway, because these melons could hold water for weeks and even months, if stored properly. [That’s how they got their name - get it?] Five thousand years ago, that was a really Big Deal. As plumbing became a thing, watermelons had to up their game. Over time, and with selective breeding, they became the sweet summer picnic favorites that we love. Watermelon plants (Citrullus lanatus var. lanatus) can take up some space. The 5-sided vines may reach 10 feet in length and the leaves are large. Plant watermelon seeds one inch deep in groups of 6 to 10 seeds. These seeds should be planted in ‘hills’ that are 3 to 4 feet apart. These hills are mounds of loose, rich soil two feet in diameter. Once seedlings emerge, save the best 3 and snip the others off at ground level. Mulch around the plants to reduce weeds and retain moisture. Individual watermelons can be grown in a container, but it should be large - at least 5 gallons. They can also be grown up trellising or on stock panels, but each melon will need a hammock. In the Bay Area, it is best to plant watermelon in May and June, though seeds can be started two weeks after the last frost date. Seeds will not germinate at temperatures below 70 degrees F. Row covers can be used over seedlings to protect them from pests and to retain some heat. Watermelons prefer a soil pH of 6.0 to 6.8. Watermelons do require a significant amount of water to produce fruit, but avoid getting the leaves wet to prevent fungal disease. If the leaves wilt in the afternoon, don’t worry about it. If they stay wilted into the evening, check moisture levels. Once fruit starts to appear, you will want to get it up off the ground with some straw. This reduces the chance of belly rot. Reduce watering just before your watermelons ripen to increase sugar levels and intensify the flavor. Like most plants in the Bay Area, watermelon are likely to be attacked by aphids, cutworms, crickets and grasshoppers, armyworms, cabbage loopers, leaf-footed bugs, earwigs, flea beetles, leafhoppers, leafminers, nematodes, slugs and snails, thrips, whiteflies, and spider mites. As a cucurbit, watermelon is also subject to stinkbugs, cucumber beetles, and squash bugs. Many of these pests can be thwarted by dusting your melons with kaolin clay, a non-toxic fine powder that clogs up their breathing holes. Diseases that can affect watermelon include damping off, powdery mildew, downy mildews, verticillium wilt, root rot, fusarium wilt, angular leafspot, curly top, and white mold. Nearly all of these diseases are related to overhead watering, so don’t do it. Most watermelon varieties are resistant to anthracnose, but seedless watermelons (below) are not. Unlike other cucurbits, watermelon is not susceptible to cucumber mosaic and I have no idea why. Unsuitable environmental conditions can lead to blossom end rot, bitter fruit, blossom drop, and poor pollination. One nice thing about growing watermelon is that you can plant the seeds in a raised bed, straw bale, or container, and then let the vine cover unplanted areas, or areas that are looking poorly. The large leaves shade the ground, stabilizing temperatures and making the soil more habitable for worms and beneficial soil microorganisms. Add a little mulch and you can be preparing that area for planting next season! Add a watermelon plant to your foodscape every summer and save the seeds for next year's crop! ​Note: What’s up with seedless watermelons? Scientists use a chemical process to double a watermelon's 22 chromosomes, creating watermelons with 44 chromosomes. Then they pollinate the female flowers of plants with 44 chromosomes using pollen from male plants that have 22 chromosomes. The resulting offspring have 33 chromosome and are highly unlikely to have viable seeds. Why do healthy plants fail to set fruit? Your plants look lush and healthy. There are plenty of leaves and blossoms. You’ve been watering and feeding and mulching, just the way you are supposed to, and still not fruit. Why not? Assuming that your plants are otherwise healthy, not diseased or water stressed, there are several reasons behind fruit set failure. The most common are lack of pollinators, too much heat, not enough light, and the wrong fertilizer. While many crops, such as tomatoes, are self-fertile, the lack of bees, flies, butterflies and moths, and even wind can reduce the number of fertilized flowers. Unfertilized flowers cannot produce fruit. You can attract more pollinators into your garden and landscape with colorful flowers that offer a variety of landing pads. Plant flowers in clusters, rather than singly, for the best results. You can shake plants very gently to increase pollination rates. One of the most common reasons why blossoms do not transform into fruit is heat. As temperatures rise, plant life processes slow down. Most spring temperatures are pretty mild, but a few scorching hot days can ruin everything, at least for a while. This is because pollen loses its viability between 85 and 90 ºF. So it won’t matter how many bees stop by for a visit or how healthy your plants are. It simply can’t happen. Luckily, most plants continue to produce flowers beyond the brief heat wave and the pollen in those flowers can produce fruit. Note, hybrid plants tend to be more sensitive to temperature fluctuations. Most fruiting plants need six to eight hours of sunlight to produce. If growth is leggy and etiolated, it may be that they are not getting enough light. All plants need good nutrition to produce fruit. Unhealthy plants simply do not have the resources to produce a decent crop. At the same time, too much nitrogen can lead to excessive vegetative growth, and even blossoms, and still no fruit. 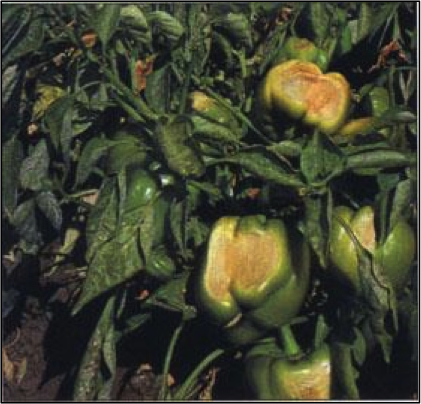 Insufficient phosphorous can also cause reduced flowering and fruiting, but that is rarely a problem in the Bay Area. Before adding phosphorous (which we generally have in excess), conduct a reliable soil test (not the OTC variety). So, if you are watering your plants properly and they are getting enough light, you may simply need to wait out the unfavorable conditions, or you may need to alter your fertilizer applications. Bite into a cucumber and, instead of crisp deliciousness, you get a bitter taste. What happened?!!? Fruit can turn bitter for several different reasons. Unfortunately, once a plant produces bitter tasting fruit, you may as well cut it off at ground level and start again, because most of the fruit it will produce from then on will have the same taste. Also, the chemicals that cause the bitterness can make you sick. In extreme cases, they can even kill you. So, what makes fruit turn bitter and how can it be prevented? All members of the squash family can develop bitter fruit. This includes summer squashes, melons, pumpkins, and cucumbers. To a lesser degree, the cabbage family (broccoli and kale) and members of the rose family can also be affected. ​The rose family includes almonds, apricots, pears, plums, peaches, loquats, cherries, quinces, and strawberries, along with roses. Select varieties that are less likely to become bitter in the first place. In the world of cucumbers, this means choosing ‘burpless’ and ‘bitter-free’ varieties. Choose planting sites that provide stable temperatures. If your region regularly has temperatures that go above 90 degree F, provide your plants with afternoon shade. Irrigate regularly, keeping the soil moist but not soggy. Monitor soil health and fertility with a soil test from a reputable lab and make sure the soil pH is correct for the plants being grown. Mulch around plants to stabilize temperatures, retain moisture, and eliminate weeds that will compete for water, nutrients, and sunlight. Harvest fruit as soon as it is ready. The longer it stays attached to the plant, the more likely it is to become bitter. Avoid prolonged storage and eat your produce while ii is fresh for the best flavor. If your cucumbers have started turning bitter, you can still eat much of the fruit, simply by peeling it and tossing the stem end into the compost pile. If it still tastes bitter, compost it. The chemicals will disperse and break down. Help your cucumbers, melons, and summer squash stay sweet with proper irrigation and a little sun protection. Temperature impacts every stage of plant growth and fruit production. We all know that most plant life processes stop when it gets really cold outside, but did you know that the same thing happens when it is hot? Each plant species has a minimum, maximum, and optimal temperature range for its different life processes: germination, seedling growth, vegetative growth, and reproductive growth. Some plants, such as peas, lettuce, broccoli, and spinach, prefer cooler weather (60 °F), while squash, melons, peppers, tomatoes and corn prefer hot weather (80 to 90 °F). The normal (phenological) responses to temperature are what make our harvest possible. And sometimes we get 90 °F weather in April. Just as the symptoms of not enough water look a lot like the symptoms of too much water, plants respond to both temperature extremes in very similar ways. (Their options are limited.) At first, they close the tiny pores, called stoma, on the underside of leaves to retain moisture. If this isn’t sufficient protection, they wilt. Then leaves begin to dry and burn at the tips and edges, and tender new growth can die. Prolonged exposure can lead to twig and branch dieback, or complete loss of the plant. What happens when it gets too hot? Excessive heat (above 90 °F) can lead to water stress and sunburn damage. It can also interfere with pollination. Pollen loses its viability at temperatures over 95 °F and seedlings die at 125 °F. While the Bay Area never sees temperatures that high, sunlight reflected off of hot pavement can easily scorch nearby plants. In crops such as corn, a sudden heat wave can reduce your harvest by 80 to 90%! Studies have shown that high temperatures can reduce the amount of time a plant takes to produce fruit, lowering both size and quality. Plants also tend to stay smaller. You cannot control the weather, but there are things you can do before, during, and after planting to help your garden and landscape plants survive temperature extremes. Deep roots and good health go a long way toward helping a plant protect itself. Shallow root systems dry out quickly and are more sensitive to heat and cold. Watering plants deeply and allowing the soil to dry out between waterings encourages roots to go deeper. And sometimes water isn’t enough. A thick layer of aged compost or other mulching material placed around trees, shrubs, and other plants can stabilize soil temperature and provide a slow-release of nutrients. Just be sure the mulch does not touch the trunk. Avoid using fertilizer when extreme temperatures are expected, and be sure to leave as much leaf cover as possible. Excessive pruning can make plants vulnerable to heat and cold. Artificial protection from the elements can take the form of shade structures, row covers, pergolas, umbrellas, and shade cloth. Blocking even a little sunlight on a hot day can help your plants get through the worst of it without sunburn damage or water stress. You can eliminate much of the work related to temperature extremes by selecting plants best suited to your microclimate (natives are an easy choice), and place them in locations suitable to their species. And be sure to install plants at a time of year when they will have enough time to develop a strong root system. Finally, have your soil tested by a reputable lab, to find out exactly what you are working with, and continually strive to improve soil structure. Healthy soil makes healthy plants. Healthy plants can tolerate heat and cold better than plants marginalized by poor soil, insufficient irrigation, or improper care.